The scientific solution to high blood pressure and cholesterol problems is not to simply start popping statin drugs, which carry with them extreme adverse effects, but rather to get your nutrition in check. And one great way you can do this is by supplementing with spirulina, an alkaline-forming, blue-green freshwater algae that studies have shown can help promote healthy circulation, modulate cholesterol and lipid profiles in the blood and even prevent the formation of heart disease, all without producing any harmful side effects. One such study was conducted by researchers at the Universidad Nacional Autonoma de Mexico's biochemistry department back in 2009, where it was learned that spirulina helps promote the healthy release of nitric oxide by the endothelium, as well as increase the synthesis and release of a vasodilating cyclooxygenase-dependent metabolite of arachidonic acid. Spirulina also helps decrease the activity of vasoconstricting eicosanoid by the endothelium. Put plainly, each of these mechanistic actions help expand the size of blood vessels, which in turn helps lower blood pressure and improve blood flow. This is important for people with high cholesterol and high blood pressure, as any potential buildup in otherwise narrowed arteries can lead to artery hardening and even blood clots. But spirulina appears to naturally prevent all this by not only regulating artery size but also decreasing blood levels of harmful forms of cholesterol. Naturally, the benefits of improved vasodilation and reduced lipid levels also extend to the heart. A related study out of South Korea published just one year later in the Journal of Nutritional Science and Vitaminology found that, even when fed a high cholesterol diet (HCD), New Zealand White (NZW) rabbits experienced reduced triglyceride (TG) and total cholesterol (TC) levels when also given between 1 and 5 percent spirulina for eight weeks. Compared to rabbits just given HCD -- NZW rabbits, it is important to note, are not meant to consume cholesterol after the nursing phase, rabbits given spirulina saw reductions in the intimal surface of the aorta, as well as significant reductions in both TG and TC. Rabbits fed spirulina also experienced increases in high density lipoprotein cholesterol (HDL-C), more commonly known as "good" cholesterol. "These results suggest that spirulina intake can cause the reduction of hypercholesterolemic atherosclerosis, associated with a decrease in levels of serum TC, TG and LDL-C, and an elevation of HDL-C level," wrote the authors of this study. "Spirulina may, therefore, be beneficial in preventing atherosclerosis and reducing risk factors for cardiovascular diseases." For these and many other reasons, including its ability to also help detoxify the body of heavy metals and prevent the formation and spread of malignant cancer cells, spirulina is widely regarded as one of the most beneficial "superfoods" on the planet. 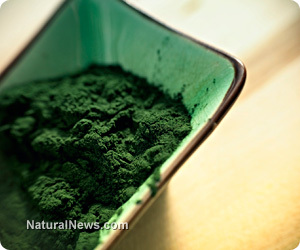 You can learn more about the benefits of spirulina by checking out the NaturalNews spirulina archive, as well as SCIENCE.NaturalNews.com.